The Father Duffy Memorial backed with the stadium-like seating. 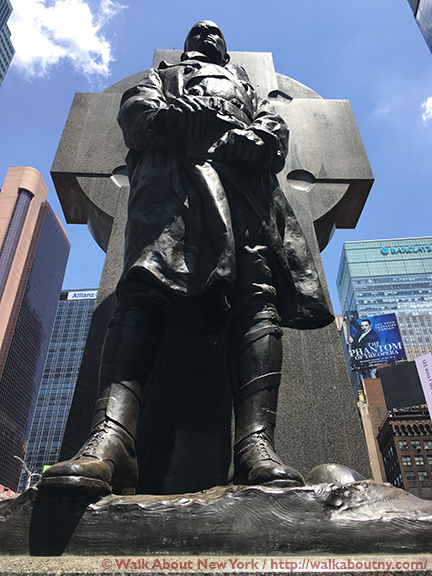 At the apex of the triangle that makes up the north end of Times Square, between 45th and 47th streets, Broadway, and Seventh Avenue, the bronze likeness of Father Francis Patrick Duffy (1871-1932) is a reminder of the range of citizens who answered the call to fight in the Great War. April 6th 2017 marked the centenary of America’s entry into the First World War; and this year marks the 80th anniversary of the unveiling of this massive stone and bronze work of art, having been dedicated on May 2nd 1937. Born in Cobourg, Canada Father Duffy attended the Catholic University of America in Washington, D.C. In 1893 Father Duffy moved to New York. He accepted a teaching position at the College of St. Francis Xavier, now Xavier High School on West 16th Street, where he taught French. After his ordination in 1898 he began teaching psychology and ethics at St. Joseph’s Seminary in Yonkers, north of New York City; he remained there for the next 14 years. 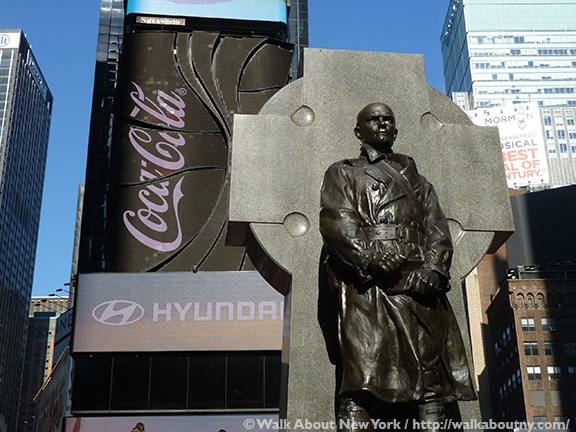 The bronze figure of Chaplin Duffy is 7.5′ tall, and the Celtic cross is 17′ tall. 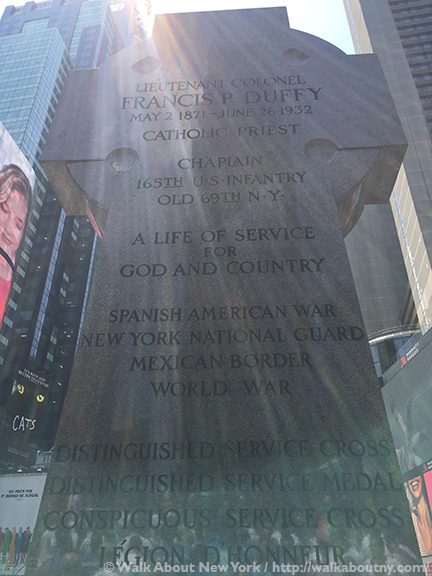 Father Duffy’s military service began in the Spanish-American War of 1898. He was ranked as a First Lieutenant, and was chaplain of the legendary “Fighting 69th” Infantry of the New York State National Guard. At the same time he served as the Post Chaplain at the military hospital in Montauk Point, Long Island. The commercialism of Times Square is everywhere. Next the New York Archdiocese sent him to the Bronx, a borough of the city just north of Manhattan, where he founded the Church of Our Savior, and became its pastor. In 1916, Father Duffy returned to the 69th Infantry, serving in Europe during World War I as part of the Rainbow Division, which had incorporated the Fighting 69th. 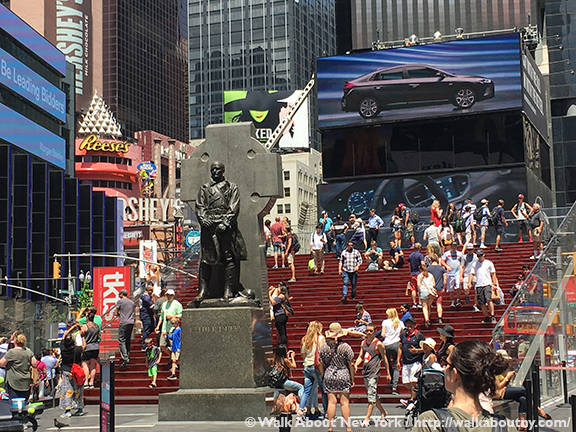 The hustle and bustle of Duffy Square is non-stop! The “Fighting Sixty-Ninth,” although including members of other ethnic groups, was largely made up of soldiers of Irish descent. The regiment had served with honor during the Civil War; and tradition tells us that General Robert E. Lee gave the corps its nickname. It briefly saw action during the Spanish-American War, and then in 1916, when it was part of General Pershing’s Punitive expedition on the Mexican border. After the United States entered the First World War, the regiment was renumbered the 165th Infantry, and became part of the Rainbow (42nd) Division. Through all these changes its members continued to refer to it by its traditional nickname. The details included by the sculptor add greatly to the artwork. 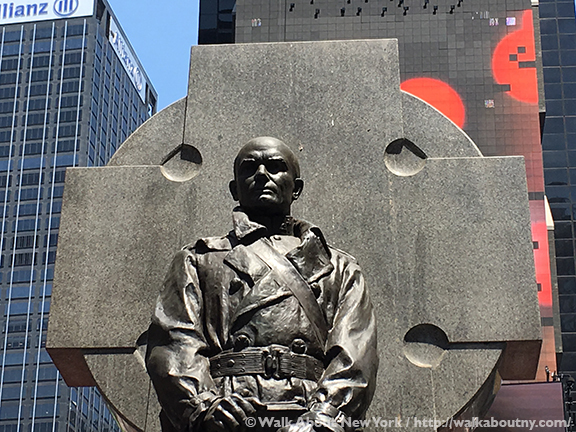 New York’s “Fighting 69th” was also the regimental home of Joyce Kilmer (1886–1918), the author of the well-known poem, “Trees” who died the July before the Great War’s end; William ‘Wild Bill’ Donovan (1883–1959), founder of the CIA; and Titanic-sinking survivor Daniel Buckley (1890–1918), dyeing during the Meuse-Argonne Offensive in France only a month before Armistice Day. 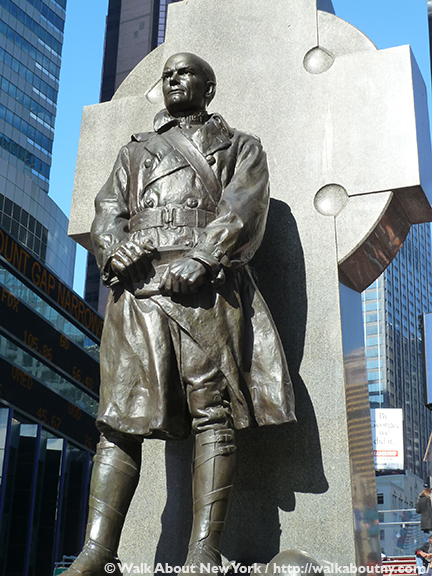 Sergeant Kilmer wrote about the division’s crossing the Atlantic. He noted that every day there was a line of soldiers, “as long as the mess-line,” waiting to have their confessions heard by Father Duffy. He also wrote about the large crowd of soldiers who gathered every morning to attend Mass. Chaplain Duffy would celebrate at an altar fashioned from a long board supported by two kegs of nails. The well-loved chaplain, an inspirational focus for the division, saw a good deal of the war; too often he had the duty of burying the young men he had christened as little as nineteen years earlier. The regiment arrived in France in November 1917, and spent the winter training. In late February 1918, these men took over front-line trenches from French forces at Laneville. On March 20, Father Duffy and the men of the 42nd came under attack by a barrage of mustard gas shells. The bombardment went on for two days resulting in more than 400 casualties; many of them were blinded. Chaplain Duffy experienced many such scenes over the months. At the front lines he heard confessions, offered Mass, visited and counseled soldiers. Father Duffy is said to have moved from trench to trench when the bombing was most intense. He would carry wounded soldiers from the battlefield, hear their confessions, and administer last rites. The chiseled back of the Celtic cross lists Father Duffy’s honors. Chaplin Duffy often traveled with a first-aid unit, caring for the physical and spiritual needs of the wounded and the dying. During quieter times, he was known for his reassuring presence in the barracks. He listened to soldiers’ fears with compassionate understanding, and tried to quiet those fears with his sense of humor. His “ministry of presence” was inspirational. Chaplin Duffy often was near the heaviest fighting, exposing himself to death as he moved from unit to unit. He was decorated with the Distinguished Service Cross and the Distinguished Service Medal. The text that is chiseled on the back of the Celtic cross reads as follows. Following the end of the Great War, which was officially terminated on Armistice Day, November 11, 1918, Father Duffy, returned to New York. In 1920 he was appointed pastor of the Church of the Holy Cross at 237 West 42nd Street, located in the still new, but rapidly developing theater district. For more than a decade this local hero and “the actor’s church” ministered in a decidedly secular world. Father Duffy served the theater-district community until his death on June 26th 1932. A 1940 Hollywood film titled “The Fighting 69th” starred Pat O’Brien as Father Duffy; James Cagney was also in the cast. It is fitting for two Irish-Americans to star in a film about a regiment whose members were once mostly of Irish heritage. The sculptor’s name and date on the Father Duffy memorial base. Charles Keck (1875-1951) chose to portray Father Duffy as stoic figure in bronze. Standing close to eight feet tall, the soldier-priest is seen wearing his military uniform with his helmet at his feet; he is holding a bible. The sculpture stands on a pedestal that is backed by a Celtic cross more than 17 feet tall. Both pedestal and cross are fashioned from Archean green granite, sourced in Angora, Minnesota. The green color is appropriate for something connected to the Irish. Mr. Keck made a maquette for the sculpture’s head; it is in the collection of the New York City Art Commission, and is displayed at City Hall. 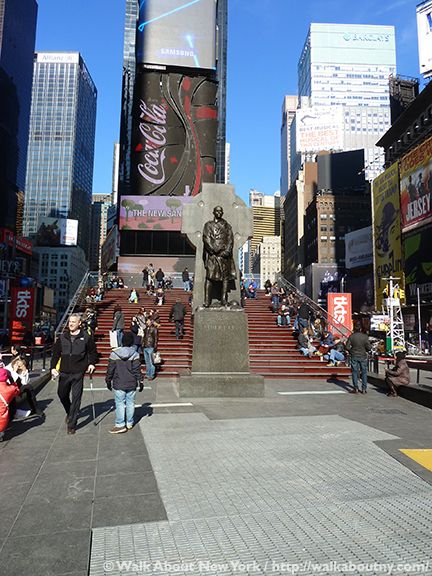 In 1997 the Times Square Business Improvement District funded the conservation and repatination of the statue. This monument offers a strong and solid presence in a transient space. Mr. Keck had received numerous public sculptural commissions. He designed the 1950 Alfred E. Smith Memorial on Manhattan’s Lower East Side, and the 1951 massive stone figures on the Brooklyn War Memorial in Cadman Plaza. 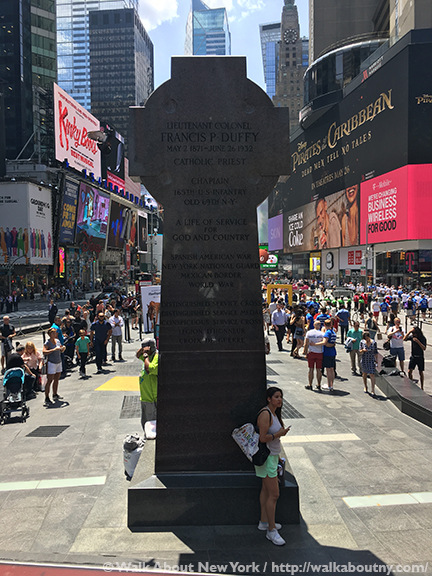 For decades his portrait of Father Duffy has stood amid the millions of tourists and locals at Times Square, the Crossroads of the World, witness to the priest’s good deeds. A Celtic cross is fitting for Father Duffy. who identified strongly with his Irish roots. Some of the millions of visitors to Duffy Square relax on the stadium-like steps. Duffy Square was enlarged and enhanced. 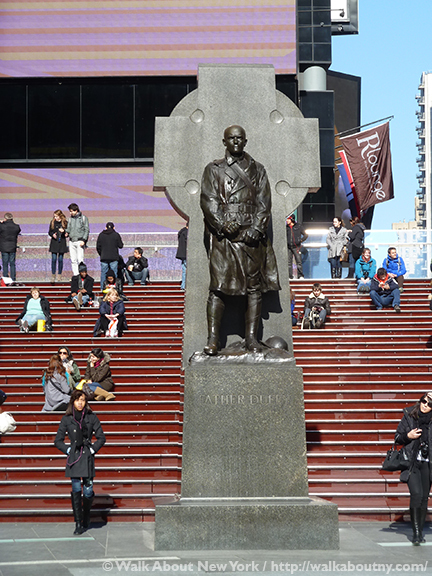 The monument to Father Duffy stands in front of a striking amphitheater-styled staircase that is constructed of red glass. It is 27 steps high, with seating space for more than 500 people. The state-of-the-art, slip-resistant glass steps are lit from below with LED lighting; they use geothermal-based heating and cooling technology. The structure also houses the TKTS booth, offering discounted theatre tickets to Broadway and Off-Broadway performances each day. Father Duffy’s stern expression is clear in close-up. 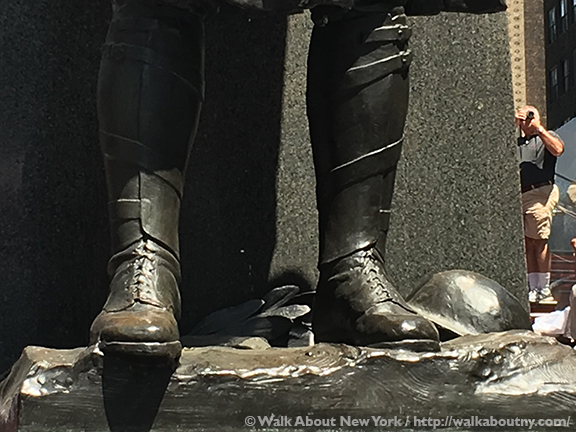 Read other articles we have published about World War I monuments that can be found around New York City. 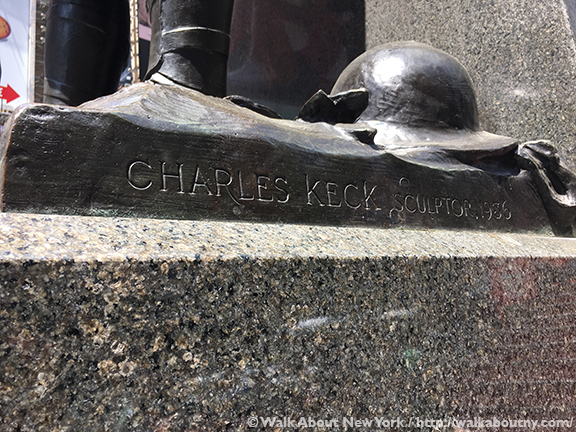 When you are part of our Greenwich Village Walking Tour you will discover the studio/home of Charles Keck, sculptor of the bronze honoring Chaplin Duffy. Take the Tour; Know More!